Played to perfection by Chicago veteran Barbara E. Robertson as the angry care-giver who stayed on to raise Nora’s three children, Anne Marie guesses traditional women tasks and skills. Hnath’s Nora is now a famed, feminist author who urges women to free themselves of loveless marriages. But, alas, as the sequel goes, some things haven’t changed in 15 years. The reason Nora has returned is because the angry husband of one of her readers found out her name, that she is still legally married and can be jailed for her behavior as a married woman. So Nora, who thought her husband had filed for divorce like he said he would, had to return through that once slammed door to plead with Torvold to file the papers. She explained it was much harder for a woman to get the divorce than a man. Enter Emmy, Nora’s now grown daughter played by ensemble member Celeste M. Cooper. Anne Marie suggested Emmy might be persuaded to talk to Torvald about filing. Instead, Emmy explains that everyone thought Nora was dead and treated the family with sympathy and that the best thing for everyone would be to file a death certificate. Just as bad in Nora’s eyes is that her daughter is engaged to a banker and wants no family scandal to stop the marriage. So what is Torvald’s view of Nora’s appearance and divorce request? Convincingly interpreted with dismay alternating with confusion and wistfulness by ensemble member Yasen Peyankov, Torvald first argues that she must file the divorce, then he picks up one of her books and learns how she described him. 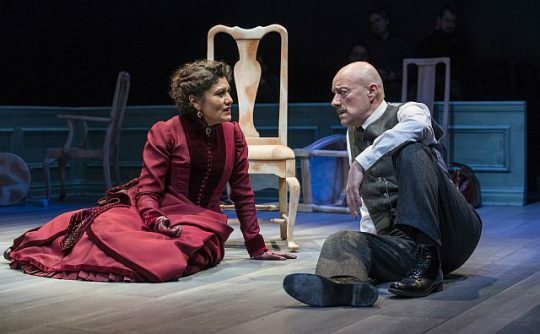 To understand the lines Torvald reads from Nora’s book, audiences should go back to Ibsen. In the 1879 play, Nora points out that she has been viewed as a doll to play with and not a person. Under the direction of Robin Witt, “A Doll’s House, Part 2, moves swiftly through Hnath’s intelligent, funny and absorbing 90 minute sequel to Ibsen’s groundbreaking play. Period costumes by Izumi Inaba nicely set the decade and wealth level but because of the subject matter this play could be set in a much later period as a stand alone play. BTW, The show also allows stage seating around the back and side as if watching a match. 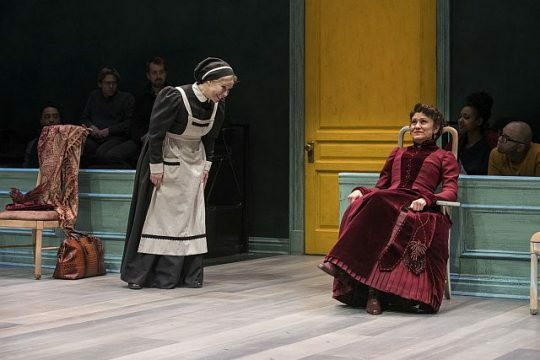 DETAILS: “A Doll’s House, Part 2, is at Steppenwolf theatre Company, 1650 N. Halsted St. Chicago, through March 17, 2019. Running time: 90 m,inutes with no intermission. For tickets and other information call (312) 335-1650 or visit Steppenwolf. For stage seating visit onstage.